I am thrilled to be participating in my first (and hopefully not last) blog hop for Scrapbook Steals! If you aren’t familiar with Scrapbook Steals, it is my Number 1 FAVOURITE place to buy scrapbook supplies at a HUGE discount! And they often have products I’ve not even heard of or used before. Plus their sister sites for Kids, Babies and She for women are just as AWESOME! Their blog is amazing too so if you haven’t been there, be sure to start the blog hop there! 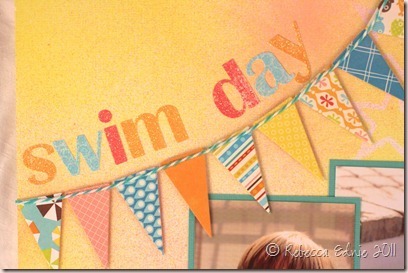 I have a card and a scrapbook page for you today! I received Taxi, a bright yellow Studio Calico Mr. Huey’s Mist to work with. Now if you know my blog, you know I am not so into bright yellow so the challenge was on. I used it to mist a sunset scene that this bright yellow was practically made for! I started by masking off the bottom portion of the card. Then I mixed the mist with a bit of water to dilute it in a spray bottle and misted the top portion. Then I masked off the sun area as well, added some pumpkin reinker and misted again. Then I misted a third and fourth time adding a few drops of rust red reinker each time until I was happy with the look. Absolutely lovely coverage and it mixed very well with the reinker. I reversed the masks covering my sky and added a second torn mask to make the shoreline. I sponged in aqua ink for the ocean. Then I tore another mask similar to but not the same as the first. I applied this mask over the ocean leaving a small section to look like the froth of the waves breaking against the shore. Then I used several brown inks to sponge in the sand. For the palm tree, I stamped it on very dark grey card stock and cut it out. Then I added ink direct to paper from the ink pad so it became a solid black silhouette. I added a sympathy sentiment and I was done! I think a sympathy sentiment was very appropriate as the sunset can symbolize the end of a life. 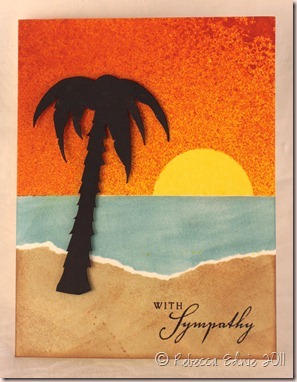 Sad but sympathy cards are very needed and appreciated. I have several other brands of mists and this is by far the easiest to mix. Thank heavens. Some of the other ones need several minutes of shaking before they are ready to use. And with Mr. Huey’s the colour you see is the colour you get. The others separate and become a gross colour so you have to shake it in order to see the real colour if you forget what it looks like. Not very convenient if you ask me! For my next project, I used a mask to create an interesting scrapbook page background. As I usually only create cards, I only bought a 6×6 mask. So I added it to opposing corners to add interest to the ‘white’ space I planned to leave on my layout. I added some water and white reinker to soften the colour somewhat. I also added some touches of a pink mist. I love how many ways you can use these mists! I was inspired by a layout by Maggie Holmes to use a banner across the page but I don’t have a banner die. Helloooo ingenuity! I looked at my dies to try and decide if I could cut down a square or a rectangle or… when my eyes settled on an ice cream die. Yeah! The cone makes a PERFECT banner! That was the most fun especially since I used up lots of scraps! I added the date ‘wheel’ to the top right but felt I needed to add some more round elements to the page. So I added the medallion stamped once on the right side of the larger photo and again in white on acetate under it. Made a nice triangle I thought. I try to keep design principles in mind more so when I scrapbook because it doesn’t come as naturally to me as card making. But I keep at it because I love the results! 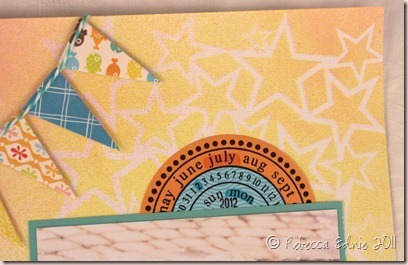 Adding things in odd numbers and in triangles tend to keep your layout more balanced. So I have three photos, pointy shapes in three places (stars in each corner and the banner), orange in three places: one photo, the title/banner and the date wheel; three circle elements and words in three places: the title, date wheel and journaling. I hope you enjoyed my project. If you’d like to visit my blog again, please sign up for updates by email or RSS feed; links are on my sidebar. Now, you are off to visit Julie Odil! Have fun on the rest of the hop! And be sure to sign up for emails from Scrapbook Steals while you are there. If you get lost, the whole line up is below! 6. Rebecca Ednie http://www.eclecticendeavours.blogspot.com/ YOU ARE HERE! I love the star background!!! Wow! You did an amazing job with the mists. Great job! Thanks for the inspiration! Such a fantastic layout, I really like how you masked the background and the fun banner! love the sunset and masking on the LO, thanks for sharing! The yellow is gorgeous! I love your use of the masks! I love your card and layout! I am much more a scrapbooker than card maker. But Learning a new technique is so much fun. Thanks so much for you detailed instruction! Can't wait to use the mist on a project! Love that card and WOW!! that is a great layout!!! Wonderful card and layout. Thanks for sharing. WOW! I love the soft colors on the layout and the sunset, beautiful. Now following. Love the layered effects that you achieved. Now a follower. Thanks for the ideas. Wonderful layout and card. Thanks for sharing. The warm colors on that summer layout are just perfect! Oh this i an awesome card. i love the strong colors! and the LO is fab. Great projects! I especially love the masking on your layout! Great projects. You did a beautiful job coloring with the mists. I love the sunset!! Amazing work! Especially love that card! Love what you did with the mists! Love the negative stars on your layout! Loved your layout – beautiful colors. I never thought about diluting…or mixing and now I'm having all kinds of ideas! Beautiful sympathy card. We don't see enough examples for sympathy cards, and for me, they are the most difficult to do. Thank you! You did wonders with e yellow – love the sunset, and your work with the masks is fabulous! Thanks for sharing this lovely card and page!Cynthia B. Thank you so much for sharing – love your card! Love the card! Thanks for the ideas!!! Love your LO! The colors are beautiful. TFS! GREAT projects . . . and I just LOVE the LO. Great way to use several sprays and a mask . . . love the background. Thanks for the inspiration!!! Beautiful card! And I love, love, love your layout!!! What sweet pictures. The layout makes them look even better!